The easiest way to tour around Paris with endless chances to hop on, hop off and explore! From the Eiffel Tower, Louvre to Montmartre – anywhere you wish to go! The comprehensive Paris Open Tour allows you to discover the attractions in Paris at your own pace. Whether it is shopping, dining, history or romance that brought you to the City of Light this tour will help you to discover your perfect Paris. Your Paris Open Tour hop-on, hop-off pass allows you unlimited hop-on, hop-off access over a 1-day, 2-day or a 3-day period. There are four routes and more than 30 stops to choose from on this wonderful tour. All the routes are interconnected, allowing you to switch between them easily. Audio commentary in multiple languages is available on-board. Where to begin your Paris hop-on, hop-off tour? Get to know the city more closely with two walking tours - Notre Dame and the Heart of Paris Tour and The Highlights of Paris, included in your hop-on, hop-off ticket. The tour also comes with three exciting upgrades that will enhance your hop-on, hop-off experience. You may choose an eight stops Batobus Hop-on, Hop-off Cruise that gives a whole new perspective to the wondrous Parisian monuments. Or, see a different side of Paris as she sparkles, shines, shimmers and dazzles under the sky on a Night Bus Tour around the city. Or maybe sail through the very heart of the city and gaze at the splendid Parisian structures and picturesque bridges during a leisurely 1-hour Seine River Cruise. The choice is yours! The bus departs between 9:30am and 7pm, every 10 to 30 minutes. Please check the 'Please Note' section for more details on the optional tours. You may board the bus at any one of the stops around the city. The voucher can be presented directly to the driver or at the Open Tour Office: 13, rue Auber 75009 Paris. 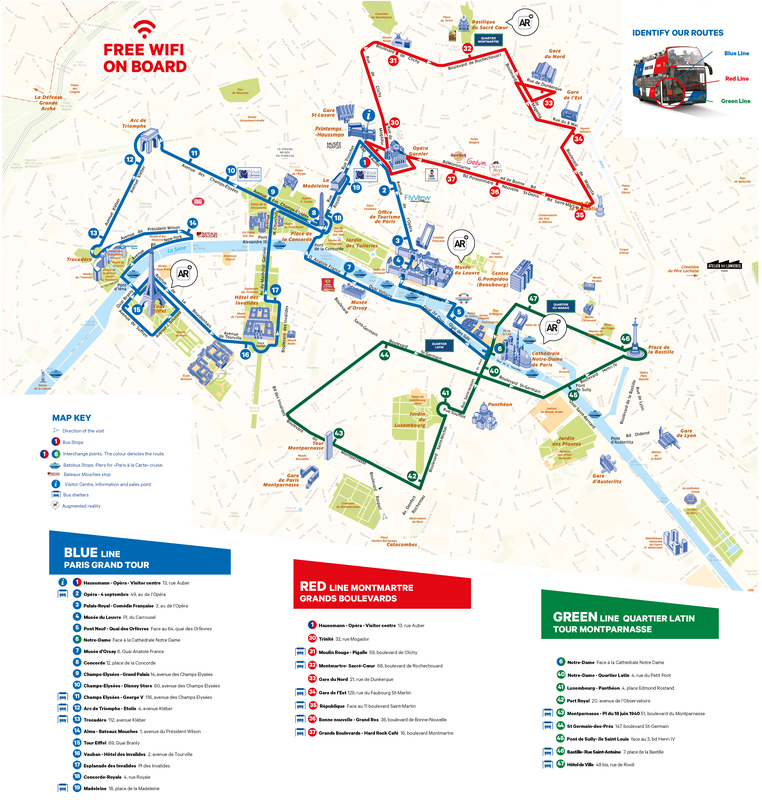 The voucher can be exchanged at any of the stops with the driver or at the Visitor Centre (13 rue Auber #Stop 1- blue route). The 2 and 3-day passes must be used on consecutive days and kept throughout their validity period. The Batobus hop-on, hop-off river cruise tickets will be provided along with the bus pass onboard Open Tour buses and not at the boat tour stops. The cruise runs from 10am onwards, every 20 to 30 minutes. Please confirm the schedule on the day of your tour. 29 November to 5 January: 6:15pm. For your Seine Cruise, make your way to Compagnie des Bateaux-Mouches kiosk (Pont de l’Alma). The cruise departs between 10am and 10:30pm from April to September and 11am (10:15am on weekends) to 9pm from October to March. So there’s no last-minute rush please arrive at the start point 20 minutes early for the optional tours. Tour is operated by Paris Open Tour - there are two different bus designs, one is green and one is red, white & blue. There are no toilet facilities on the bus or boat. Paris is a capital city and therefore political events, demonstrations and celebrations can disrupt the route at any time, especially during summer and at weekends. While every effort is made to ensure a smooth and frequent service there may be delays, reduced frequency and route alternations due to traffic and road closures. During busy times guests may not be able to board the first bus and may need to wait for subsequent buses. The service was good, however there are 2 points which I would like to comment. 1. The final service in the evening does not terminate at the starting point and this information is not given to the passangers most of them were seated thinking the bus will take the full loop and will terminate at auber. Pls inform the passangers the last stop of the bus where it will treminate. 2. some times there were too many buses coming back to back and some times it was a long wait for the next bus. Pls try to maintain consistency in the timings between the busses. Rest the tour was good and the audio guide was very informative.